Magnus Carlsen maintains lead, but more interesting is a current rating which is changing from game to game played in Biel. For the moment Norwegian is 5 points behind Garry Kasparov's record rating fixed in 2000. 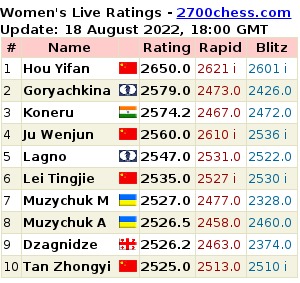 In the women's list Anna Muzychuk is now officially 2nd with 2606 points. Hou Yifan is 3 points behind her. Let us remind you that now FIDE publishes the rating list once in a month. 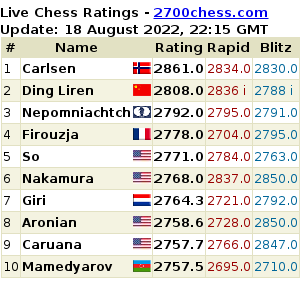 At the same time the rating lists for rapid and blitz have appeared. Noteworthy is Alexander Grischuk's, the World Blitz Chess Champion, rate - 2923. Sergey Karjakin's, the World Rapid Chess Champion, rating is lower - 2877.